“Sometimes it feels the sun is performing its magic just for me, sending me a message about life – a reminder that each day is unique and special,” Kim Weiss writes in the introduction to her book, Sunrise Sunset: 52 Weeks of Awe and Gratitude. 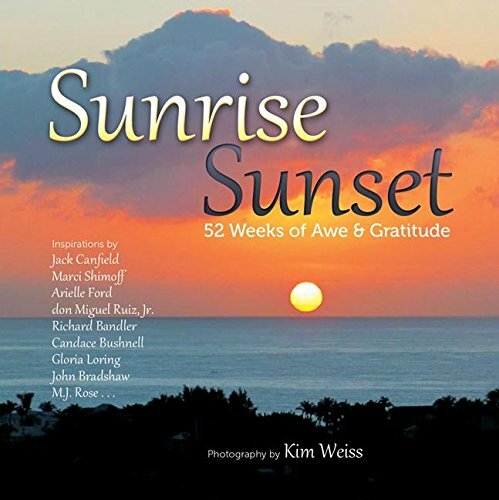 This one hundred and twenty-eight page small square paperback targets those who appreciate a stunning sunrise or calming sunset. With all photographs by the author, over fifty-two short sayings are included, suggesting reading weekly throughout the year. A portion of the book’s proceeds is donated to Aid to Victims of Domestic Abuse. The ending lists two-to-four line biographies on all contributors. With striking color photographs gracing the right half to eighty percent of two opened pages, all shots are taken from the fourteenth floor of the photographer’s terrace, facing east and west overlooking the Florida coastline. Cirrus, cumulus, and stratus clouds, silhouetted trees, or a solo bird in flight float throughout the vibrant sky colors while the sun ascends or descends the horizon. Added to the collection of the unmatched beauty of the sun’s daily arrival and departure viewed by mankind’s perspective are poems, affirmations, meditations, and thoughtful reflections from friends, colleagues, and mentors of the artist as well as authors, media personalities, and philosophers. Doctors including a veterinarian, a shamanic healer, actress, and Vietnam veteran along with a minister, rabbi, Unitarian, and Buddhist are quoted. “I can’t think of anything except sunrise at my house – when it sets the tops of trees on fire I know it’s going to be a glorious day.” ~ Candace Bushnell. This is the day the Lord has made. I rejoice as I move forward to do what needs to be done by me. I know that my way is made clear, safe, happy, and successful. My heart and mind are filled with gratitude!” ~ Reverend Nancy Norman referencing Psalms in the Bible. Although the book has a wide range of different religious beliefs and no photograph can capture a majestic scene completely, viewing a beautiful sunrise or sunset shows how the Creator of the universe is amazingly artistic and creative. This small assortment of pictures with words to ponder would make a great gift or table top book in a guest room or beach house that recalls the marvel of nature. Thanks to the Bookpleasures and the author for furnishing this complimentary book in exchange for a review based on the reader’s honest opinions. This review will be posted on Bookpleasures and Amazon with links on Bookfun.org, Godinterest, Pinterest, and LinkedIn. Thx, Jackie ~ I got your address for winning the last contest! Enjoy.